Welcome to “All In or Fold”, our weekly segment where we review the start of a manga or comic series of our choice as if we just picked it up off the shelves. Our goal is to offer potential readers a brief understanding of the content presented, and help them decide if it is a good idea to pick up the series for themselves moving forward. So let us jump in and decide, should we go All In on this one? The best example I can think of when it comes to explaining how Seven To Eternity works is the beginning of a tabletop gaming session. Your friend invites you over, saying “hey man let’s play some DnD”. Sitting down at the table with your group of usual people (plus that one random guy who tagged along but you don’t know with whom), the character creation process begins. Asking your Dungeon Master if you can play a gunslinger, he gives you the go ahead. It’s a little less traditional than the usual high fantasy classes, but nothing too weird. “Okay”, you think, “but what if he’s a magical gunslinger”. Double checking with the DM a second time, he tells you that there are rules for that so it shouldn’t be too much trouble. Going one step farther though, you ask him a third time; “But can he be a magical gunslinger that fires bullets that actually call forth the mystic abilities of other sorcerers?”. Of course, in response to this inquiry, you would be lucky if your DM thought you were joking. In the world of Seven To Eternity, however, that line of thought is the norm. And by calling it normal, I mean that’s the power set of the primary protagonist. Given the wildly fantastical train of thought that I just established this series to have, it may come as no surprise when I say that the story suffers from being a bit of a mess. This is not to say that it is bad, however. Far from it, the world of Seven To Eternity is one of the most unique I have ever encountered. It has the DNA of your classic high fantasy settings, complete with goblins and elf-like races roaming the streets. Kingdoms have risen and fell, leaving behind ruins of what once was strewn across the landscape. Yet there is plenty fresh to see as well, from a giant sentient crocodile-like being that can warp people long distances using its gaping maw, to a ghastly red being that wisps around on the air playing a flute to summon minions to do his bidding. Magic plays an integral part in the world of Seven To Eternity, where it is established that some sentient beings are born with an innate magical “gift”. For example, one character has the gift of “Charm”, and has the innate ability to enlighten people with a feeling of peace and understanding (among other things). Those who awaken such gifts can become part of the Mosak order, a group of individuals who are supposed to work together to neutrally defend the world from magical threats. The issues with the writing, however, start to come into play when it comes to the unraveling of the plot itself. Almost directly from the start, Seven To Eternity jumps into nonstop action for the majority of the first few issues. Very briefly, it is established that the land is currently controlled by the “Mud King”, a ruler who grants individuals their heart’s desire in exchange for getting inside their heads and being able to see and sense whatever they perceive (effectively making them an extension of himself). Through some means (which is clarified halfway through the volume thankfully through the use of a flashback), the Mud King managed to slander the family name of the main protagonist and force them to live in the wilderness. After a quick call to action, Adam Osidis (our hero in question) packs his bags and sets off on a quest to end the Mud King’s reign one way or another. From that point on, the first volume is almost entirely action set pieces. A multitude of names and terms are used that are not entirely explained, if they are clarified at all. Instead, it is left to the reader to ascertain what is going on through context alone, or to pray that the characters spell out what they mean later on down the line. Furthermore, when there are the few moments dedicated to exposition, it is done almost entirely via short flashback sequences which honestly feel a little overused after being seen three times. Despite the chaos of how the story unfolds, the way it is written does in fact seem very deliberate. Through the course of the drama that occurs, a full party of adventurers is eventually assembled for a greater quest than what Adam initially sets out for (the “Seven” in the title alluding to the seven members of the party). If anything, I could once again come around to my Dungeons and Dragons analogy for this. 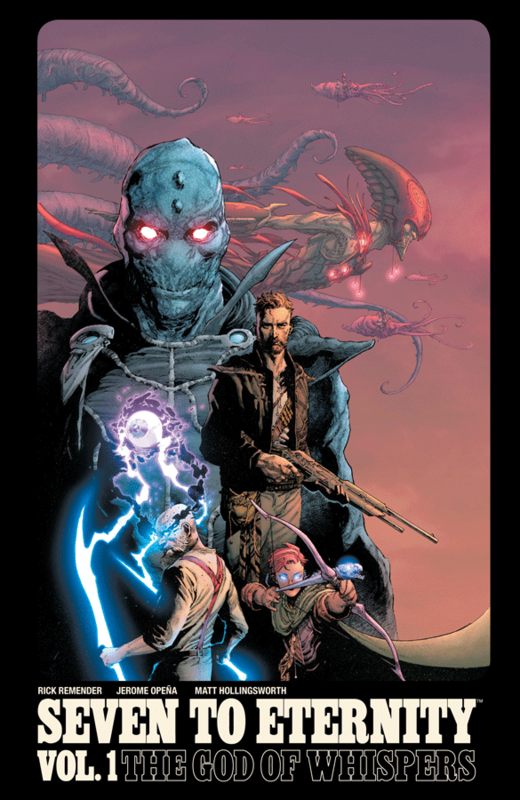 The first few issues of Seven to Eternity do not necessarily serve to establish the full narrative like the beginning of many series, but instead to pull together the main cast for their quest that will serve as the plot moving forward. This is similar to the beginning of a tabletop campaign, in which the Dungeon Master finds some contrived way to get everyone’s characters in one spot so they can begin interacting and working together. It may not be a graceful method of writing by any means, but that is not to say that it does not work. Because of the emphasis on pulling together the cast for the journey ahead, you would expect the main draw for you to continue the series would be the cast. In some respects, this is true. They have wildly varying personalities and magical abilities, plus a few absolutely stellar visual designs (more on that in a moment). There is also a lot of conflict between them, which promises greater development down the line. However, because it takes so long for all of the characters to be established, the only one at this point that seems more than one-dimensional is Adam Osidis himself. He is a deeply conflicted man, driven by an instilled sense of honor and a duty to protect his family he left at home. On the other side of the coin, he is terrified of the prospect of his own death and unsure of how “good” he really is. If you think philosophical debate on the nature of morality is the bomb, you will like Adam. As always, you simply cannot discuss this medium without talking about the quality of the artwork. In this case, it may be a bit more important considering its need to set it apart from the rest of the many, many works within the genre of high fantasy. Luckily, I am glad to say that in this respect Seven to Eternity is top notch. The design of everything is ridiculously varied, from the wide landscapes to the individual characters. A dreary and dark color palette is used for much of the land, to illustrate the corruption that has spread throughout. In stark contrast though, the depictions of magic are splendid, using a variety of luminous colors to make it pop from the backgrounds. Spirits fly through the air and monstrosities are conjured from the mud of the earth. The details of each character’s outfits are distinct, along with their faces and general body shapes. The only bad thing to say about the visual design, honestly, is that it is a bit “busy” at times with how much can be going on in one panel at once. Of course, this is a minor complaint considering that it is just a sign of how much work its artist put into it if anything. Seven To Eternity is a bit of a mixed bag. On one hand, each panel is an absolute joy to sift through for the minute details found throughout. The world inhabited by its characters is rich with lore and history with a special brand of mysticism quite unlike anything I have seen before. On the other hand, it asks you to suspend your curiosity for the details of the story itself, hoping that you will commit to the path ahead as it takes its time to unfold. In the end though, I think that despite its flaws, Seven To Eternity definitely has enough going for it to outweigh its problems, and I look forward to reading the rest of the party’s journey in later issues. I went All In with this one.